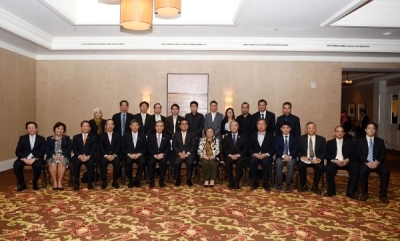 February 14, 2016, at 1600hrs (local time), at the RitzCarlton, Rancho Mirage, California, U.S., representatives of the Association of Thai Professionals in America and Canada (ATPAC) and Thai professionals in creative economy paid courtesy call on Prime Minister Gen Prayut Chan-o-cha to exchange views and listen to the Government’s policies on the development of science and technology, and creative economy. The Prime Minister expressed pleasure to meet with Thai professionals of such high caliber with different experiences and expertise. 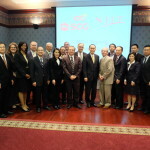 He believed everyone had good intention to join forces in developing the nation to catch up with the developed countries, and stated that the Government stood ready to listen to views and opinions regarding reform and development of Thai science and technology and innovation. The Government has clear goal in exploiting science and technology, as well as creative economy, to free the country from the middle-income trap, that is, expediting in human resource capacity enhancement, seeking new knowledge to enhance national competitiveness, promoting “STEM” education program which integrate the learning of science (S), technology (T), engineering (E), and mathematics (M) in an interdisciplinary and applied approach for national development, producing manpower in the needed areas, and identifying future industry development as a driver of Thai economy. According to the Prime Minister, cooperation with the developed countries is needed in order to transfer technology and knowhow, create linkages between R&D sector and the private/industrial sector, and attract the private sector to take part in investment on innovations. 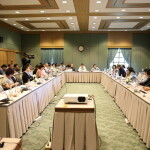 The cabinet has, so far, approved cluster-based Special Economic Development Zones Policy with 6 targeted clusters in the initial stage: 4 super clusters– 1) Automotive and Parts Cluster, 2) Electrical Appliances, Electronics and Telecommunication Equipment, 3) Eco-friendly Petrochemicals and Chemicals, Cluster, and 4) Digital-based Cluster), and 2 clusters—1) Agro-processing Products Cluster, and 2) Textiles and Garment Cluster. Targeted activities include Software (Embedded Software, Enterprise Software, Digital Content), Data Center, Software Park, Movie Town, Thai Motion Picture Production and Motion Picture Supporting Services, all of which are the expertise of U.S. The Prime Minister also stated about promotion of SMEs and startups. 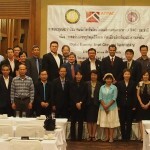 ATPAC representatives and Thai professionals in creative economy endorsed national development and competitiveness enhancement based on the development of science and technology. They suggested that the Government encourage public and private sectors to make use of sciences and the scientists in national development and security.